Standard Gauge Gravel Spur: 1912 - 1918. Locally harvested pine or fir. 1900 - 1942 - Quartz heavy river rock from the Bear River. Miller Couplers (Passenger Equipment): 1875 - 1902? No standard before OA&;E ownership. G old was discovered in 1848 throughout the area which would later become the towns of Grass Valley and Nevada City. By 1850 Nevada City was one of the largest cities in California. This prosperity in a remote region brought with it difficulties in transporting goods and supplies. During the early 1850s, locals began calling for a railroad, and for 2 decades the call went unanswered. Frustrated by the failing schemes, the local populace – lead by two brothers, John and Edward Coleman – took it upon themselves to build their own railroad. Construction began in 1875 on the Nevada County Narrow Gauge railroad, being supervised by John Kidder, who had just overseen construction of the Monterey & Salinas Valley Railroad. Early projects said the railroad would reach Nevada City by November of 1875; however, a troubled financial market and severe winter weather delayed construction. The line was completed to Nevada City on May 11, 1876. The railroad was immediately profitable. Within the first two years an additional locomotive was added to the roster, and by 1880 the railroad had 4 passenger cars and 35 freight cars on the roster. (1) The financial outlook was so good that dividends were first paid in 1881 and again in 1882. In August 1881 the first serious accident occurred on the railroad when a train derailed while descending the grade north of Kress’ Summit. In the state of California liability extended beyond the company and onto the directors, should the company be unable to pay. John Coleman became concerned with the liability from a possible wreck of a picnic train. After a decline in revenue during the years 1883 and 1884, the Coleman brothers concern towards their personal liability increased. During the annual meeting of the board on April 2, 1884, John Coleman resigned as president of the railroad. John and Edward Coleman sold their stock in the company to John Kidder, who became the majority shareholder. He voted himself president of the company. The Coleman brothers continued to operate the Idaho mine until 1891 when they sold their interest and moved to San Francisco. John Kidder served as the president of the railroad for 19 years. He took pride in his little railroad, managing it with a keen eye for detail. In 1886 he purchased land adjacent to the Grass Valley yard to become the site of a new home. From his mansion Kidder could oversee the railroad and thanks to a subterranean speaking tube system, he could communicate verbally with the depot. (2) During his tenure as president, the railroad was kept in top-notch condition. The locomotives were kept clean, their brass polished regularly, and the rolling stock was regularly painted. railroad served as the primary connection to the outside world during the end of the 19th century. As the twin cities of Grass Valley and Nevada City continued to grow, the railroad brought in the supplies necessary to keep the wheels of commerce turning. That important life-line was disrupted on August 25,1896 when the Bear River Bridge burned, requiring a new Howe Truss section be built. John Kidder passed away in 1901; his wife Sarah Kidder became the first female railroad president in the world. For the next twelve years she ran the railroad successfully and oversaw a modernization program. To reduce the trip time from Colfax to Grass Valley a new line was constructed that crossed the Bear River in a new location, eliminating the crossing at Greenhorn creek. The new viaduct was 331' (100.8m) feet long and 173' 9" (52.9m) tall and regarded as the tallest its kind in California when built. When the new line was completed in 1908 the trip from Colfax to Grass Valley was 8 minutes shorter. The old line remained in place and was called the You Bet Branch. The original Bear River Trestle was dismantled in 1910. The remaining portions of the original route continued to serve the railroad. Service continued to You Bet station where a gravel spur was constructed down to the Bear River. The gravel spur was converted to dual gauge and railroad purchased two locomotives to operate it. The northern section of the old line operated to the northern approach to the Greenhorn trestle where an interchange with the Greenhorn Railroad was located. The Greenhorn Railroad supplied cut lumber to the NCNG until 1918. 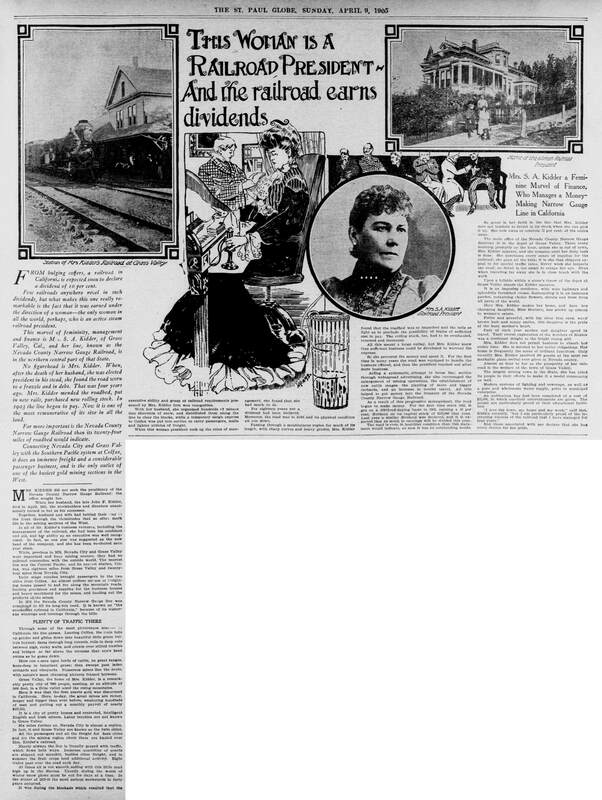 In April 1913 Sarah Kidder sold her shares of the railroad to Walter Arnstein and Samuel L. Naphtaly, the President and Vice President of the Oakland, Antioch & Eastern railroad, a standard gauge interurban line in the San Francisco Bay area. Rumors circulated that the line might be converted to standard gauge. These rumors proved partially true, when a third rail was laid from Colfax out along the original line to the Bear River bridge where a new spur was constructed to collect gravel from the river bed. This gravel was sold to locally to various dam construction projects in the Sierra Nevada Mountains. During the summer of 1915 a fire destroyed the Grass Valley engine house. The blaze devastated the railroad leaving most of the line’s locomotives heavily damaged – including the recently purchased #6. Lost in the fire were two passenger cars and two locomotives were damaged beyond repair. Little Porter 0-6-0 #4, which had been stored out of service, was put back into service while the other locomotives were repaired. With the shop complex of the railroad being largely destroyed, the car shop was converted into the new engine house. Competition from automobiles cut into the railroad's profit margin. In 1919 the last dividend was paid and by 1921 the company was operating at a deficit. A direct stage line from Auburn to Grass Valley and Nevada City opened in 1925 putting the company into further hardship. Harry Mitchell, president of the railroad petitioned for abandonment on September 25 1925. The news lead to public outcry. After several meetings among townsfolk and business owners the Committee of Twenty-One was formed to promote shipment of local goods on the railroad. Mitchell postponed the proceedings for another six months until April 1926. When the Commission approached him about delaying the abandonment, he offered to sell the railroad to them for one dollar. On the advice of C. B. Sexton of the Eureka-Nevada Railroad, the Commission began to consider the offer. On May 12, 1926 a group of local businessmen lead by J. Earl Taylor agreed to Mitchell's terms and the railroad was once again controlled locally. Under their leadership the railroad became profitable again. In 1929 the railroad was doing well enough to purchase second-hand equipment from the N-C-O and Southern Pacific Narrow Gauge. The purchase of additional locomotives and equipment allowed for the retirement of many antiquated cars, which reduced the overall maintenance costs. During the great depression while many were out of work around the country, the NCNG continued to operate in the black, thanks to the strong local mining industry. America’s entry into World War II lead to a decline in mining activity in the region. Wartime restrictions on mining supplies non-essential to the war efforts halted the flow of materials to the region. In March of 1942, permits for purchasing gold mining materials were canceled and the NCNG lost its primary source of freight traffic. Already hard hit by expanded local roads which had siphoned off passengers and freight for several decades, the line filed for permission to abandon on April 9, 1942. On July 10, 1942 the line operated the final revenue train. Over the next year the line would be scrapped by Dulien Steel. Equipment that was still in good shape was sold to the U.S. Navy, repaired and shipped to the supply depot at Pearl Harbor. Nevada County, California, the most prosperous mining county. - Nevada County Promotion Committee, 1904. Promotional booklet containing photographs of Nevada County in 1904. Includes a photo of a passenger train at the Grass Valley depot. The Route of the Nevada County Narrow Gauge circa 1912 for Google Earth. Collected Nevada County Narrow Gauge Photographs. From the Grass Valley Union, Daily Alta California, San Francisco Call and others. This Woman Is A Railroad President And The Railroad Earns A Dividend. Article on Sarah Kidder, President of the Nevada County Narrow Gauge. St. Paul Globe - April 9th, 1905. Sacramento River Association and Nevada County, Calif. - Greene, Henry Dart, 1936. Promotional film of the fruit industry in the Sacramento Valley and Chicago Park in Nevada County. Includes footage of a NCNG mixed train in Chicago Park and crossing the Bear River Viaduct. Demolition of the Bear River Viaduct, August 23, 1963. Very Short Films, Office of Image Archaeology. Preview of Sierra Shortlines Volume 2. Nevada County Narrow Gauge Railroad Museum located in Nevada City, California. Part of the Nevada County Historical Society.